Barbetta is happening. It's that place that you walk past and wish you were dining at because everyone looks like they're having a great time. 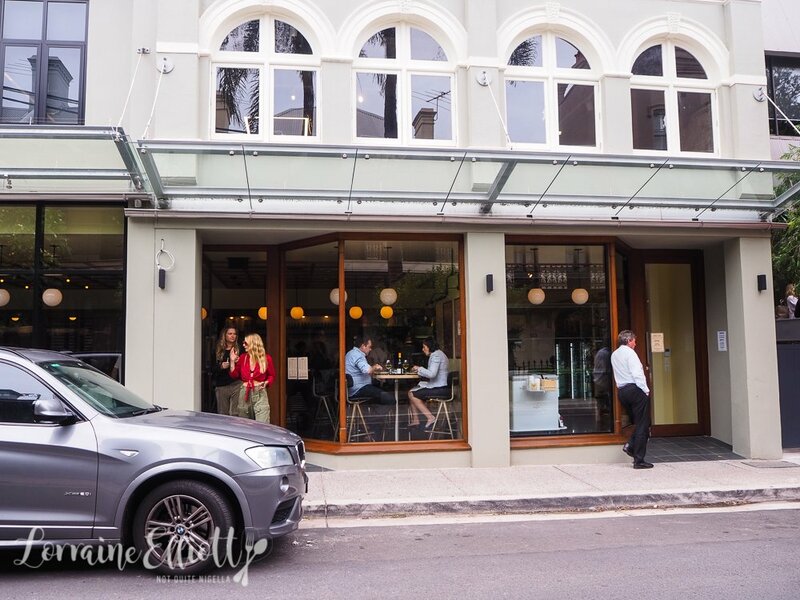 With three Italian brothers, twinkle eyed waiters, a pastry chef that sings opera plus a simple but delicious pasta based menu, there's a reason why there is a queue. 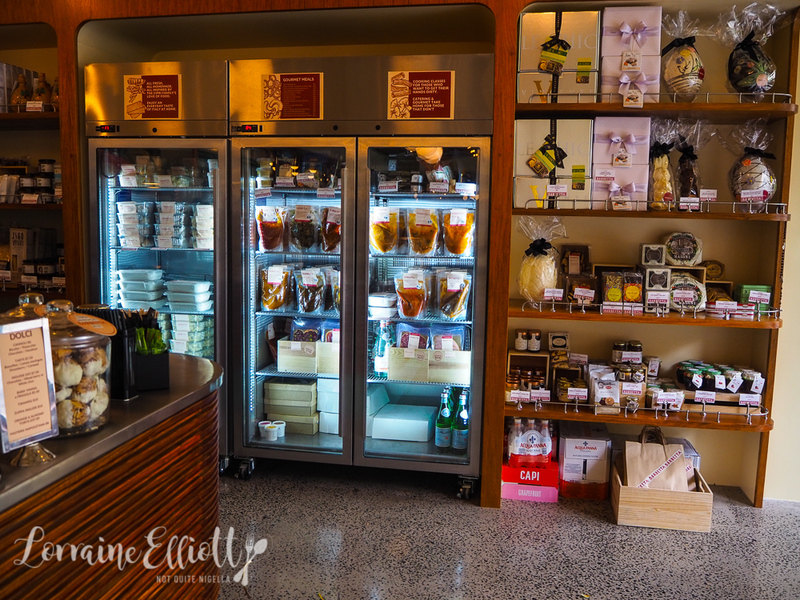 Barbetta is a breakfast and lunchtime spot but also a providore with takeaway coffees and cakes available as well as ready made meals for people to take home. 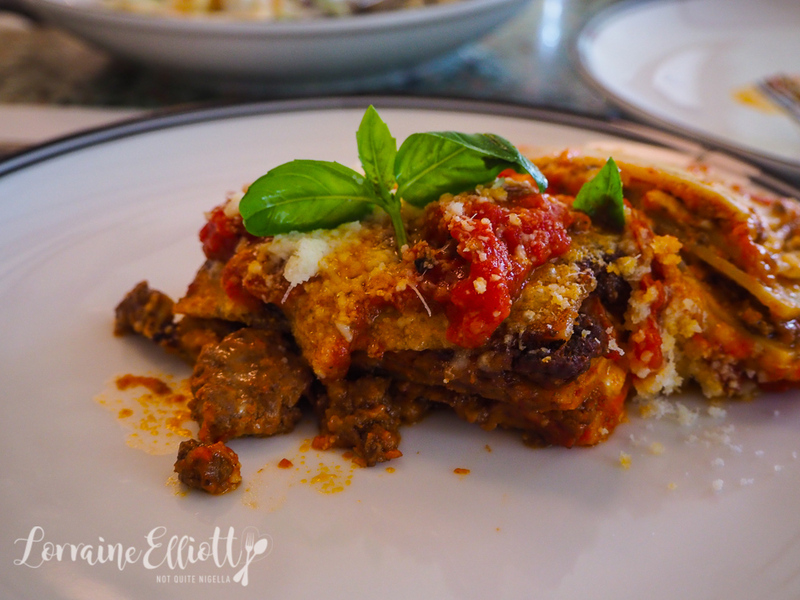 They also hold classes for their classic lasagne as well as pasta making classes. Barbetta is by the same three brothers Joe, Anthony and Carmelo (executive chef) who brought us Cipri. And so far our waiter with a Snow White tattoo is shaking his head at Girl Next Door and I. 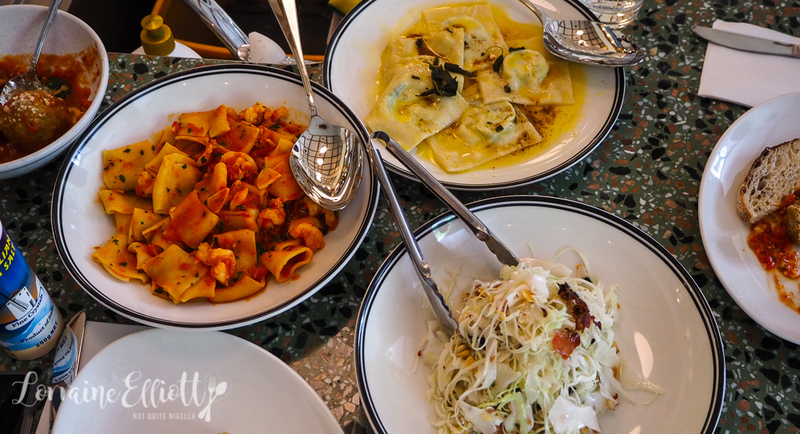 "You can come back to have more," he says gently chiding us for ordering meatballs, two pastas and a salad for lunch. "We're good," we reassure him and he makes one last attempt to dissuade our ambitious order before putting it through. Today there's a bit of a delay with our food but that's more to do with the two very large tables that have just sat down. The meatballs come out first. 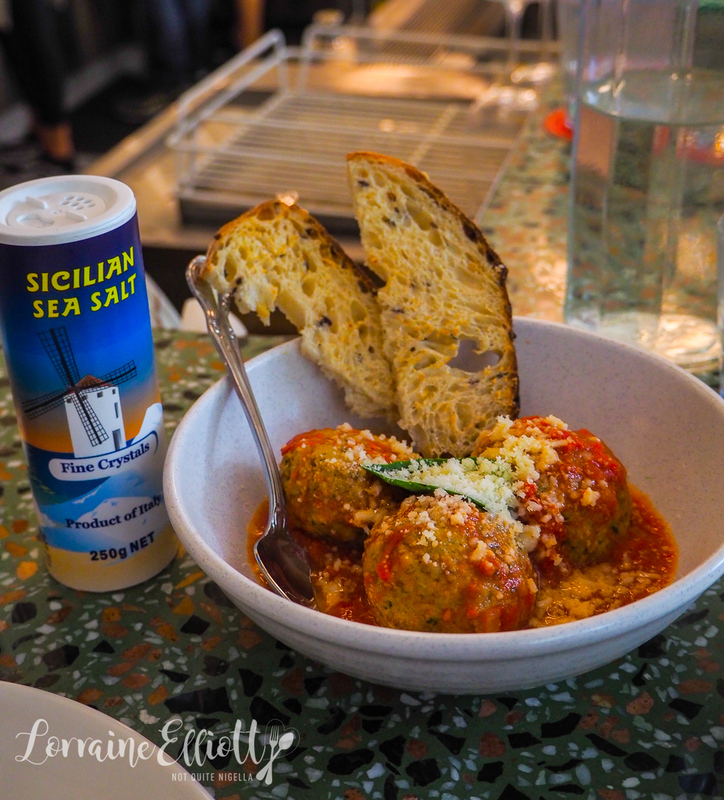 There are three enormous, tender pork and veal balls with tomato passata and a slice of crusty grain bread. We fall upon these greedily and happily. 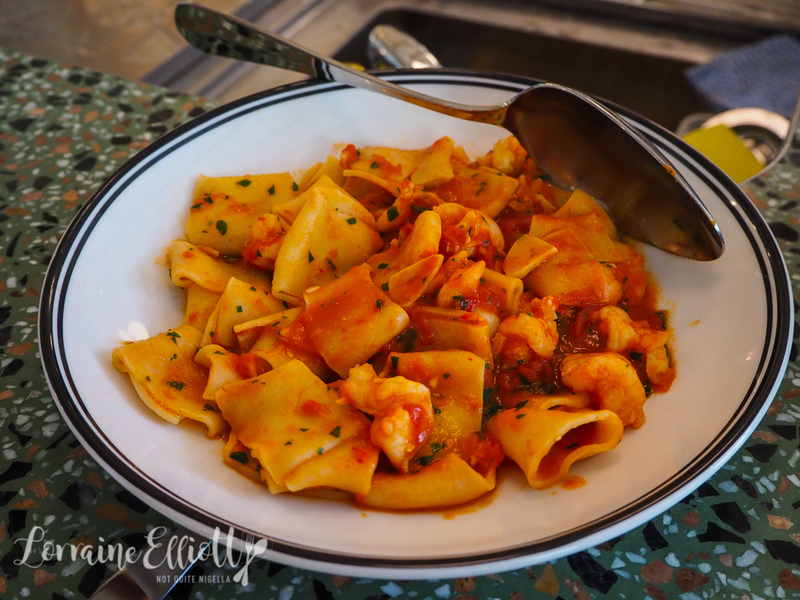 The calamarata pasta is in a thick, ring shaped pasta that is said to resemble calamari rings. It comes with prawns, Napoli tomato sauce, chilli, garlic, basil and parsley. It's strong and bold in flavour and I enjoy this a lot going back for third and fourth helpings. I like that all of the pasta is cooked perfectly al dente too. Girl Next Door I differed in what we preferred. 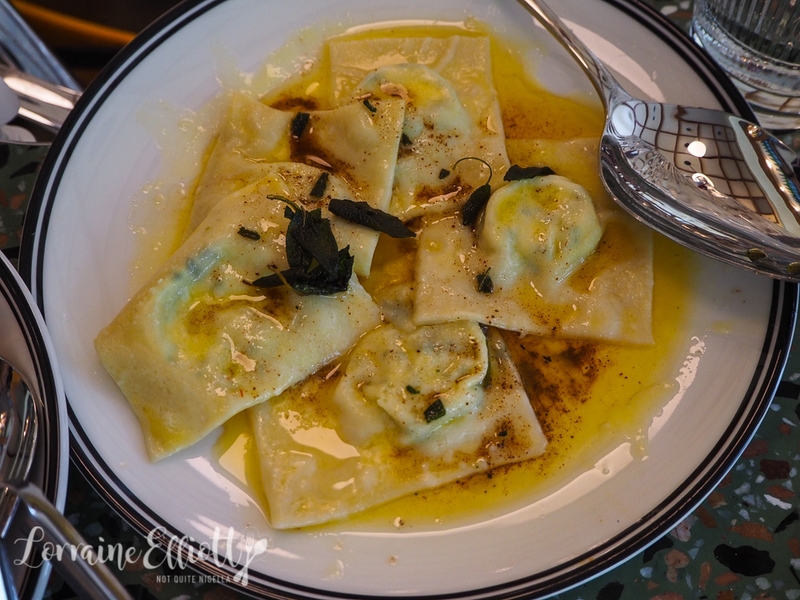 While I really loved the bold tomato based sauces, Girl Next Door loved the burnt butter and sage sauce with the large ravioli filled with spinach and ricotta. The burnt butter is fantastic especially with a little bread to mop it up. 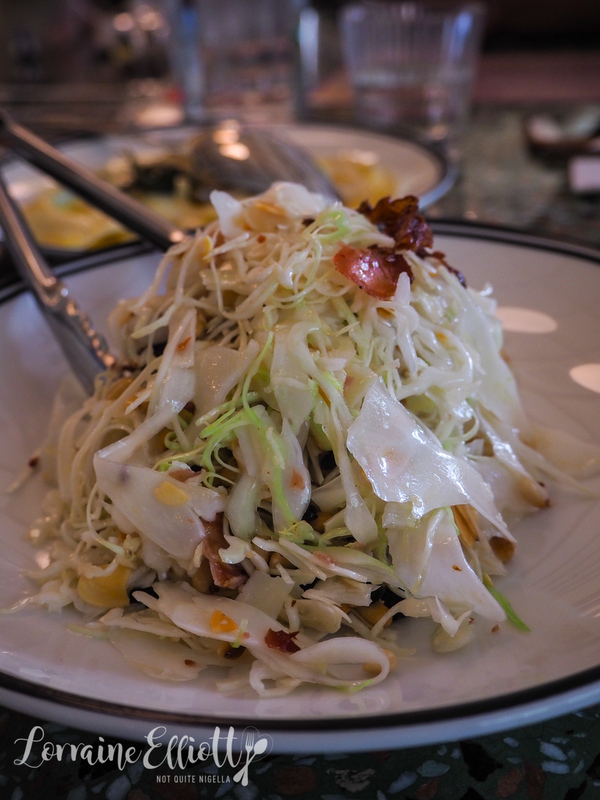 The savoy cabbage salad reminds me a bit of the famous Buzo salad and there's pine nuts, raisins, pecorino, crispy pancetta and lemon. It's not bad but it doesn't have the blanket of reggiano which is what made it so moreish to me. To its advantage, it is lighter because of this so if you're ordering creamy pastas then it's a good match but to eat on its own, it would be better with reggiano on top or with added protein (you can get grilled chicken added to this). We are sitting at the bar which means good opportunities for looking at what other people have ordered. The man sitting next to Girl Next Door at the bar orders the "best ever lasagna" and it looks very enticing. When it wafts past my nose I perk up. "I guess I'll have to come back one day for that," I say longingly. "Well let's see how we go and maybe we can fit it in," says Girl Next Door and I almost hug her from happiness. We did end up ordering it which prompts our waiter to confirm this with us wide eyed. "I don't understand how you can eat this much..." he says bewildered. And bless them they cut it in half so that we could share it although we didn't ask for this. It looks better as a whole piece and Girl Next Door knows me well and says, "Shall we try and put it back together?". Hilarity ensued - as we were transporting one half to the plate to join the other half, I dropped it top side down causing us to laugh so hard people turn around. After a bit more of a kerfuffle we sort of put it back together. 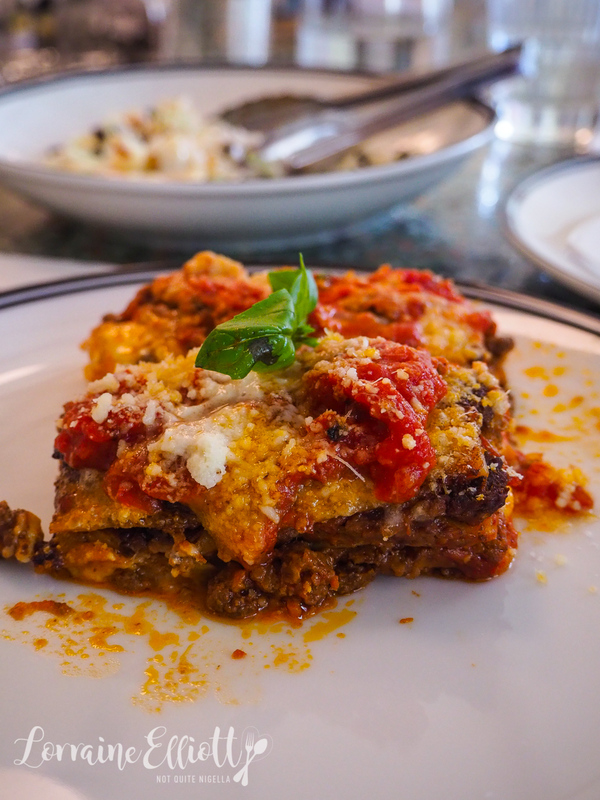 So is this the best ever lasagna? It's absolutely delicious and my favourite pasta dish of lunch so yes do get it. I think by now they sensed that we were quite food crazy and knew that we'd stick around for dessert. 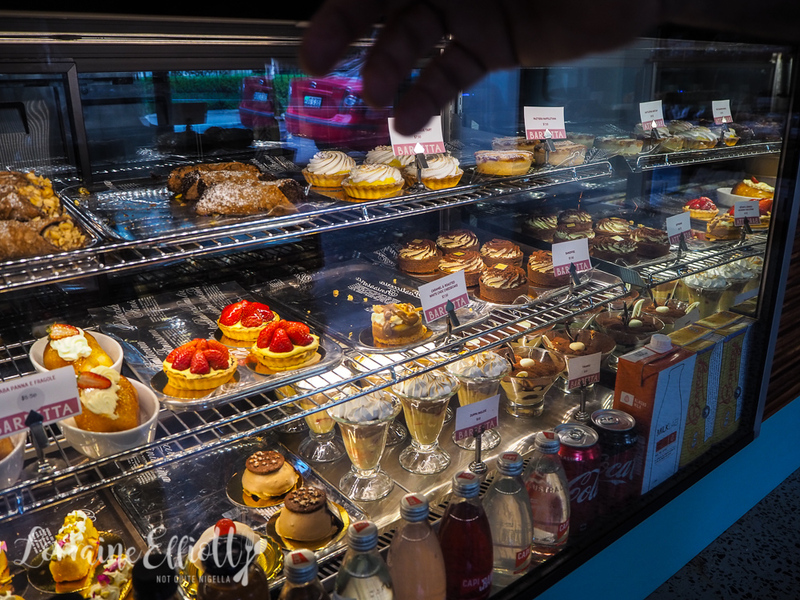 We ask them what is good and they show us the pastry cabinet. We are dithering so the manager says, "I'll send over the pastry chef. He makes our pastry and sings opera!". Naples born pastry chef and opera singer Rocco Speranza opera singer comes over. 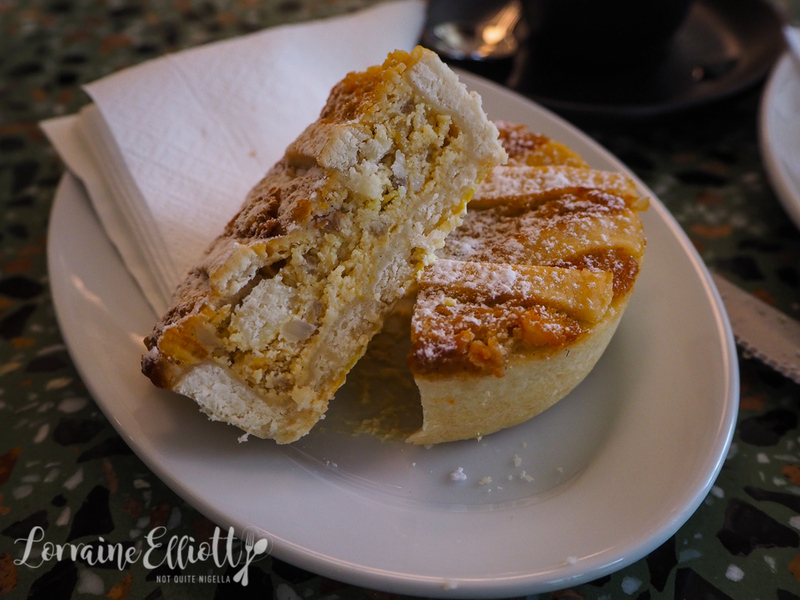 Every day he starts work at 5am and makes the pastries from scratch using imported Italian ingredients (except the Australian ricotta). He enthusiastically explains the sweets and points us at his personal favourites, the pastiera and the hazelnut cannoli. Pastiera is a seasonal Neapolitan Easter cake. It is divine, soft and fragrant with cinnamon and creamy ricotta it's like the distant Italian cousin of a custard tart. 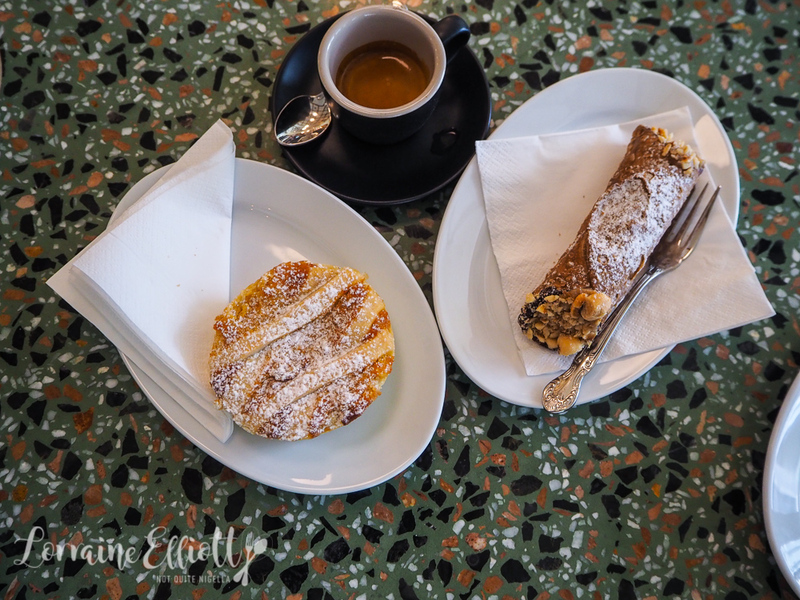 The hazelnut cannoli is dipped in chocolate on the inside and is filled with a chocolate ricotta filling and each end is coated with toasted hazelnuts. It's crunchy on the outside and soft and creamy on the inside. Rocco, who officially finished work an hour before just can't leave as he says he loves the atmosphere here so much. And the tenor he is talked into singing a quick aria for the animated crowd today. He keeps everyone hanging onto his every note. You do have to be lucky to hear him sing as he only breaks out into song once or twice a week (mainly during the pastry cooking class we are told). 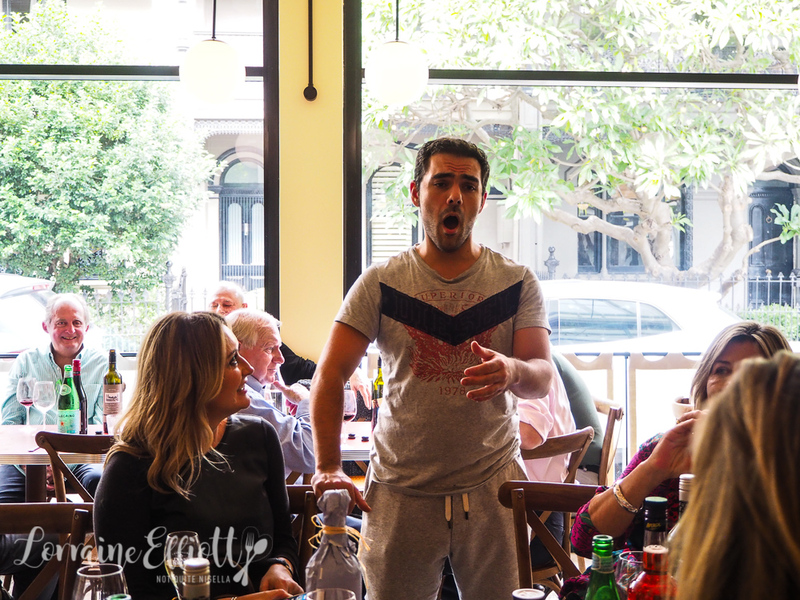 He explains to us that has been singing opera since he was 11 and sings with Opera Australia as well. And which does he enjoy more? Singing or cheffing? "I do both with passion," he says. And when Girl Next Door and I leave three hours after lunch started, he is still there. 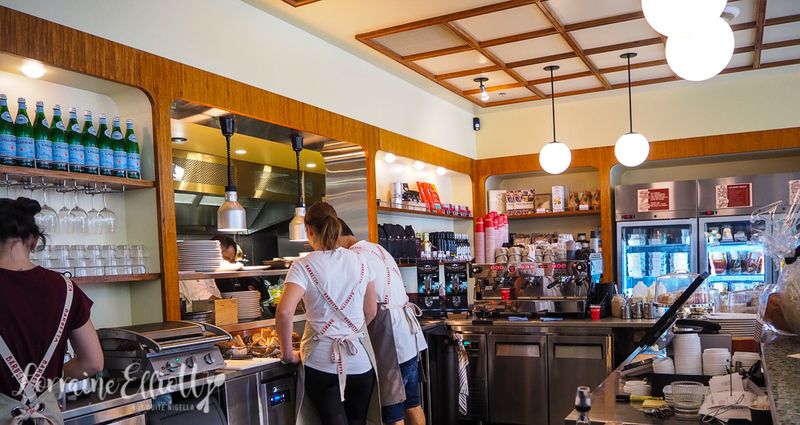 So tell me Dear Reader, are you ever dissuaded from ordering food by staff? And do you ever voluntarily stay after work? And do you prefer bar or table seating?